Since Beto was out of town, and Sue had a reservation with Phil, we both decided to make it an estrogen only boat, excluding Phil. Sorry Beto!! arriving the wind and swell were so/so. and was expected to kick up. After some discussion of where to go... and my inner desire to see a Vase Sponge.... we ended up deciding to go to some mysterious pinncle near Deep E3. Phil mentioned that there were a few Vase Sponges, but not as abundant as the other site in consideration I was not expecting to see a Vase Sponge. The anchor was set, we did the our GUE EDGE.. and rolled overboard. The top of the pinnacle was at 136ft and it went down to 230ft (ish). We arrived at our planned depth to a beautiful Vase Sponge. TAWANDA!!!! Lucky day... We meandered around and realized that most of the life was between 180ft and 150ft. Before our time at 200ft, I signaled Susan to go up and explore shallower. WOW!! What an awesome site. Susan spotted a yellow eye in a crack. I was loving the gorgonians, hydrocoral, lots of huge nudibranchs like, Tritonia Festiva, Triopha Catalinae. Besides seeing the Vase Sponge... the best part of the dive was at 150ft. There was an area that comes up to a ledge... the formation of the topography around the ledge made it look like we were in a coudesac, and better yet.... it was right next to the anchor line. Time flies when your having fun. It was time to go up. Nothing really special on Deco besides some very small pelaganics floating by and it was long. Back on the boat... Phil told us some stories about the pinnacles at 80ft near blue fish cove. It was a very Healing Experience. Driving down the weather was doing interesting things. I couldn't get my normal peak at conditions on the way down due to the fact that fog had completely socked in around the hotel by the sea. Strangely enough, as soon as we got to Monterey, the fog completely disappeared. Monastery look "interesting" with some big sets rolling through every once in a while. After waiting in line for a bit (I think people have finally figured out the new opening time at Pt. Lobos) we rolled into the parking lot and took a peak who as around. As it turns out there were quite a few people there taking advantage of the good conditions. Don and Elissa were taking a class, Matt and Clinton rolled in soon after and Susanne and her friend joined the party just a bit later. As I forgot the float, I got the duty of being the human buoy, while Karl got to lug the gear into the water. We soon got our gear sorted out and headed on out. As the cove didn't look like it had great visibility we elected surface scoot for a bit before dropping down at the mouth of the cove. Conditions weren't bad but nothing incredible. We passed by our old friends Worm Patch and Hole-in-the-Wall and continued on out to the end of Beto's Reef before jumping off to Montanna. And the visibility kept getting better and better... and better... and better. Until, once we reached Montana we could look up and see wave's dancing on the surface. Right away at Montana I saw a nice Tritonia festiva. Karl lead us through the crack to the north east side of the reef which was interesting as every time I have been at that site before we always circle around it. The crack is actually quite a bit larger than I had realized. Once on the other side, I saw a nice Cabazon just hanging out on a rock at northern side. We continued circling the reef clockwise and checked out the Gorgonian farm. Soon after I spotted a nicely sized Flabellina iodinea and stopped to admire him for a bit. It might be the season for them or something, as they were covering the eastern side of Montana like they are having a convention or something. On the eastern side, the current picked up a bit and just blew us along the reef before depositing us on the southern most tip. As there wasn't much time left on the clock, we got the scooters out and went over to do a brief flyby of Mini Montanna before turning the dive. We came back in and passed by Crossroads. I made sure to point out the encrusted line that is out there. The sponges seem to have completely taken over and made the line their home. After passing by Q-tip we did our bottle switch on Granite point wall and continued on into the cove. I made an attempt to find the cave, but had no luck so eventually we jumped back accross middle reef and ended out dive at the Worm Patch. At the ramp, Clinton and Matt had already completed their dive, and they must have heard my mental communications as they jumped down to help take gear off us. Suzanne and crew came in a short time later. After comparing notes we all agreed that it was especially cold in the water today. Questioning my sanity of even driving down to Point Lobos with a forecast of 8-12 feet with 10 second intervals, Todd was hot to go, so I tagged along anyway. Getting to Lobos, looking out over the bluff was no more revealing as there was fog in near the cove, but it was burning off, but still pretty choppy. What the heck, we're here, let's go see. Getting out of the mouth of Whaler's Cove, at Phil Sammet's suggestion we decided to play it safe and dive Twin Peaks, a site we've frequented. As we got to the site I could see that the water was a nice clear blue...very cool! Todd and I got in, did our checks and descended to the top of Twin Peaks at 120' in a vista of scenery. Looking south-west, I could clearly see the outline of Great Pinnacle, never thought I'd ever see that! Wow, a cool relaxing dive and spending our entire bottom time here as opposed to scootering here and spending a very limited time here. It was quite a treat. Though we were at 150 feet, it felt like an 80 foot dive due to all the light present. Though I didn't bring my big video camera, my point and shoot was able to get video and picked up some good color. I'll post that later when I do some editing on it. All in all a spectacular dive! On Saturday, John, Rob, and I were planning a little expedition to Twin Peaks to document the Aldisa cooperi that we saw there a couple weeks ago. This time Rob would have his camera, rigged for macro, no less. Last time we saw them, they were near the bottom of the big peak, so we were planning for a slightly deeper dive than the usual Twin Peaks run, and packed the appropriate gas for it. Rob volunteered to lead, so we told him where we had found the Aldisas (since he wasn't on that dive), and we came up with a plan based on our expected depth range. The viz was really good right at the ramp, so we were excited about our prospects. We surface scooted out to about 35 feet, where we could still see the bottom, and dropped in the sand channel. It was a pretty uneventful travel to the Sisters, via Lone Metridium. We hit the first sister, and I could literally see the second sister from there (and the shadow of the third, I swear!). The viz was just incredible. We headed out along the Road, and almost immediately, I saw a Doriopsilla spaldingi -- an exciting enough slug, in my opinion, to stop the team to check it out. The iridescent ring around the slug was particularly glowy -- more blue than white. After we looked it over, we continued on. Very shortly after that, I saw the sponge that the Aldisas eat, and I couldn't believe my eyes, but there was a yellow-orange slug sitting on top of it. I stopped us, again, to check if it was A. cooperi (vs. A. sanguinea), and there were the tell-tale spots down its back. I showed it to Rob, and he asked if he should take some pictures of it. Of course! So at this point we were about 10 minutes into the dive, at 120', and we'd already completed our "mission". Sweet! Now we could just have some fun at the peaks! After Rob finished up taking pics, we were about to get going when Rob spied a big lingcod hanging out under an overhang, with its mouth hanging open. We swam over to take a look, and then were about to leave again, when John signaled us. He innocently pointed to the reef, and I looked over to where he pointed. In hindsight, I can't believe my reg stayed in my mouth, because I'm sure my jaw dropped open when I saw not one, but two little mystery Okenias. These were the same kinds of slug that we had seen one of about a year ago, and were told by the "slug experts" that it is possibly an undescribed species. We have been hoping to see another one ever since! The next minute was filled with screaming through my reg at Rob. I was not just excited that we had found it again, but we had found two! We have a permit to collect up to two of these little guys, since, in the event that it actually is an unknown species, two are required to authenticate that. I wasn't even sure if John knew what he had found, but he did. I practically mauled him as I told him he rocked (yes, I now have a hand signal for "you rock"). As Rob was taking some photos of it, we found three or four more within about 10 feet of those two. It must have been small white nudi day on the Road, because there were also dozens (or maybe even hundreds) of Diaphoradoris, and at least a dozen Aegires. But the Okenia stood out easily, like a ball of whiskers sitting on the reef. Disclaimer: don't try this at home, kids, unless you have a permit to collect at Lobos. After Rob got shots of the first several that we found, we decided we would collect two. We carefully removed two slugs from the reef (one of them came with a bit of its substrate, which we figured would be useful to identify what it eats, plus it would give it something to eat for the road). Once we were finished with that, we discussed what to do next. At this point, I figured if we headed out to the peaks, we'd basically get there in time to turn around. So I suggested we just stick around the area for a while and then head in. So that's what we did. It was amazing what a slug fest it was out there. In addition to all of the white guys, and a lot of the usual suspects, there were quite a few of the Aldisas. Eventually we decided to head in. When we got to the Sisters, Rob suggested we head across to Beto's, which I always love to do in good viz. There were lots of canary rockfish over the sand on the way, as is typical out there. The viz was so good, I could clearly see Beto's more than 30 seconds before we actually got to it (which, using the 150 ft/min scooter speed estimate, tells me the viz was over 75 feet). When we got to Beto's we headed in along it, stopping to say hello to the wolf eel. The trip in and the deco was uneventful, except a little meeting with Suzanne and Nathalie at our 30 foot stop. We had originally planned to survey the transects for dive 2, but we decided that we had done enough for the nudibranch project on dive 1, and we would just have fun on dive 2 (fun being looking for nudibranchs at Granite Point). The viz was still really good, although with the sun lower in the sky, the water wasn't quite as bright. We headed out on the sand channel and before you know it, we were at the main wall. Rob had requested that we go to (what we refer to as) "the hydrocoral spot", so we motored until we got to the spot, and then clipped off the scoots and kicked around there. There was an impressive showing of nudibranchs out there. We saw the usual dorids, more Aegeris, several Dendronotus albus, tons of trilineatas, quite a few Limacias, four Hilton's, and an Adalaria jannae. Of course Rob regretted not bringing his camera. We left there with the plan to hang out on the east side of Middle Reef ont he way in. We got back to the end of Middle Reef and took a left to get to the east side. By the time we got in there, I decided I was took cold to do more than a fly-by, so that's all we did, and we hopped over to the sand channel and headed into the cove. We ascend along the wall of the cove, and headed in from there on the surface. We descended at one of the drop zones in the bay and landed in the center of a small shell island. We headed West and found a 3-4 ft ledge and swam along it for most of the dive. There were a lot of vermillions swimming in and out of the ledge and tons on nudibranches at the bottom. We headed to Sherwood Forest and had a lot of fun playing around the kelp, and checking out the marine life. We found group of sheep heads swimming at the top of Granite Point Pinnacle. Vis was very good. 40-50ft with no much swell. Here is a quick edit of the dive. We achieved the objective of the dive... fun! Blademiros and a couple of hours at the Sport Center before meeting Capt Jim for a fun dive on the Escapade. MichealB was our in training capt and crew all in once so it was an exciting boat. We headed to the drop zone outside the harbor and after some basic lesson on how to read the GPS/navigational aids we arrived at the site. Saturday I was invited to dive with the Kitties on-board of Phil's boat :-). The target site was a nice canyon that crosses Ed's wall half way. Sue and I have seen the canyon a few times and it promises to be a good dive. We dropped down to about 170ft and headed NW on the wall. The high-light was a nice basket star that Robert found and a few large nudibranches. After about 15min we headed up to 130ft and motored back towards the starting point while looking at rock-crabs and some very nice tree fishes under a small overhang. We finally located the canyon and crossed it over. At about 120ft Allison located another nice tree fish, this time in the open, and near it there was a crack with two wolf-eels on it. One large one small. While looking at the creatures we were located but a large school of rock-fish that was swimming around us. After about 30min we headed up the top of the pinnacle at 70ft and drifted our deco. After getting blown out for a few weeks, it was nice to have fairly calm conditions for the Feb. tech boat. Light winds were out of the S/E, with minimal swell which made for a flat ride down to the Yankee pt. area. After a fair amount of discussion, we decided on a site that I had some numbers for near Flintstones that we had not been to before. Allison and I were first off the boat and we quickly got ourselves organized and down the line. After checking and moving the anchor, we started in on our dive. We were anchored on the south side of the pinnacle and started exploring it clockwise. It didn't quite match up with what I remembered from the sonar maps, but it was nice. there was impressive structure as the pinnacle itself looked like it bottomed out around 180' or so; I kept scanning below for vase sponges. We followed the pinnacle around to the north side where we ran into Clinton and Nick. After some discussion, we decided to leave the main pinnacle and scooter north where we found a second pinnacle. After a few minutes there, a fair number of rockfish started gathering around us and playing with our bubbles. We found a really nice canyon on the eastern-side of the pinnacle with some very nice topography and a large number of gorgonians lining the walls. All too soon, it was time to call the dive on time. While we were both thinking that following that pinnacle around would take us back to the start point, we didn't want to chance it with that many teams in the water. We doubled back and pretty soon were back on the main pinnacle and saw several sets of HID lights. Deco was uneventful, and we drifted with John/Matt/Mark for the entire way up. 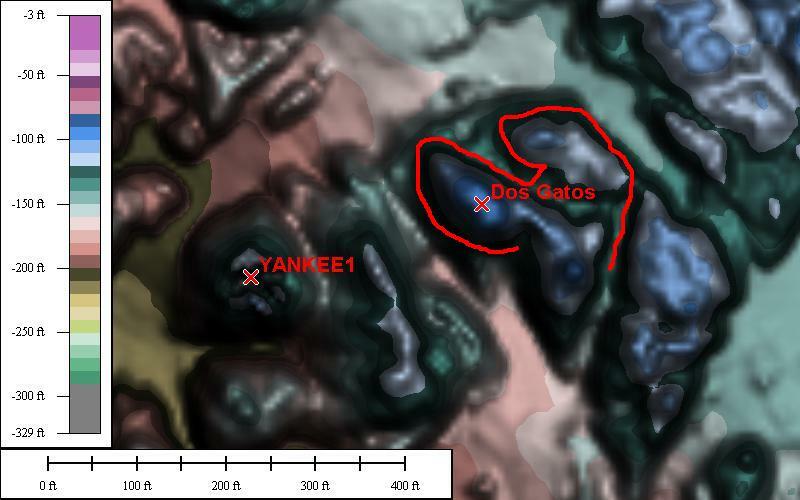 After some careful thought, we named the new site (with the twin pinnacles) "Dos Gatos". The name is also somewhat fitting as we always manage to explore new sites when Kevin is not around. Second dive at Outer Pinnacles, and lunch (for some) at Baldemiros. Here is a map of the site. Sue and I got to Lobos at about 8:30am. We have schedule to dive with Phil but the conditions had us a little worry. The cove was still flat so we ventured to the outside to check the actual condition. Plan A was K3/YankeePoint area but as soon as we past the west corner of the park the wind and swells were large, with white caps. It was all coming from the south so backing a little bit we found very calm condition just outsite E3. We dropped at Deep E3 and headed for the drop-off near the sand. We did a little detour (I felt by compass was stuck for a while ????) for a while and found a large rock with 10-15 crinoids on top. They are not as colourful as the tropical ones but still pretty nice to see. We finally got to the based of Deep E3 and located the purple sea fans that live in there. I had the impression that it has crown quite a bit since last time. It's now 2 ft diameter. It's always weird to be looking at the bright purple colony at 220ft. It always make me think if I have enough He as this are not suppose to be in our water. We continued around the pinnacle and found several cool vase sponges and some large school of rock-fish. The plan was to motor to E3 and ascend on it but a couple of unsuccessfully attempts at 150ft had us abandon the plan and we came back to the up-line. We decided not to deployed an SMB for a change and deco on the up-line. There was no current at all and it was a nice deco with moon jellies swimming by. Let's hope the south wind continues so we get decent conditions on Sunday.